From Oh! 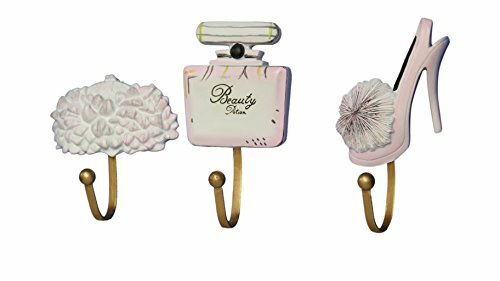 Trendy™ This trio of wall hooks stands alone in traditional or modern room décor - or makes a great utility item for fashionistas and beauty enthusiasts. Styled after a vintage high-heeled shoe, perfume bottle, and powder-puff with realistic details and textures. These beautiful make up wall hangs are the perfect modern home décor necklace wall hanger to add a modern, yet chic style to any room. The make up wall hangs are made of a polyresin material that helps to prevent scratching and breakage. This along with the modern, vintage style ensures that your make up wall hangs will be enjoyed by you and your guests alike, for many years to come! Don't wait, buy your decorative make up wall hangs home décor now! HOME/OFFICE DÉCOR: Use the make up wall hangs in your bedroom or near the front entrance, or anywhere in your home as a modern decorative make up wall hangs home décor piece. These make up wall hangs are unique enough to catch your eye and be the focal point of the room, yet subtle enough to be the perfect décor accent in any home. BEAUTY: The beautiful, clean lines of the make up wall hangs décor piece show the detail and attention to craftmanship that goes into every artful telephone and fan bookend and home décor piece that we make. JEWELRY: This modern, vintage inspired make up wall hangs home and bedroom décor pieces add a classic and modern, yet contemporary touch to any modern office or home décor. Also perfect for hanging necklaces, jewelry, hats, coats, or clothes. QUALITY MATERIALS: Our make up wall hangs are constructed from high quality polyresin materials. This material ensures the make up wall hangs home décor pieces - at 1 lbs total - will attach firmly to any wall.